Mersea & Co. brings you a collection of irresistibly scented bath salts in a beautiful boxed gift set. Each mineral-rich single-use salt soak serving is lovingly packaged in a charming glass tube. Just pour one of the six individually-scented tubes into your bath and enjoy. Saltaire Salt - a blend of jasmine, citrus and bamboo. Voyager Salt - aquatic notes with citrus flower and tangerine. L'eau Tide Salt - soothing amber, fresh linen and sea breeze. Pique Nique Salt - jasmine, rose and lily with coconut and apple. Splendide - orange blossom, lemon and lime softened by freesia. Sun Kissed - notes of lemon, cardamom, juniper and flowers. Your gift is securely wrapped to safeguard the shipping process and arrives presentation-ready in signature gift crate. A complimentary card with your personal message is included with your gift. Measures 7" x 5" x 2". Bathing Sea Salts Collection is a hand delivered gift. These gifts are delivered by one of our local design centers located throughout the United States and Canada. Same day delivery is available for most gifts when ordered before the cutoff time. The cutoff time for Bathing Sea Salts Collection is 2 PM in the recipient's time zone. 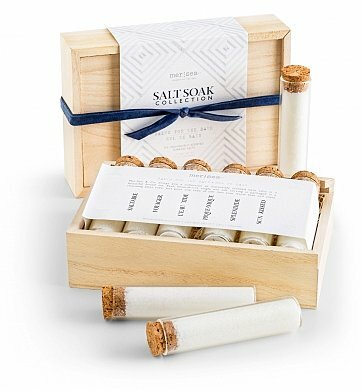 Six individually scented soaking salts in corked glass tubes. 1.5 ounce glass tubes hold single-use soaking salt servings. Arrives presentation-ready in limited edition gift crate.